We work in all parts of the reserve, some of which is administered by the Launceston City Council and the remainder by the Tasmanian Parks and Wildlife Service. Our members and volunteers attend working bees on the second Saturday of each month. Our major objective is to “engage in environmental maintenance and restoration”. The reserve covers an area of over 440 hectares, bounded on the south and west by the spectacular gorge of the South Esk River and Trevallyn Dam and to the north and east by the suburb of Trevallyn. The reserve lies mainly between sea level and 220m above sea level. The reserve is used for a variety of recreational activities, including orienteering (an excellent orienteering map is available), horseriding (there is a large equestrian area), bicycle riding, cable hang-gliding, boating (on Trevallyn Dam) and walking and jogging. The reserve’s flora species and communities are diverse and include a concentration of threatened species. This diversity is remarkable in an area which is so close to a major urban centre. The major habitat is white gum and black peppermint open forest but deep gorges and steep southern slopes provide habitat and species diversity. Several species of fauna which occur in the reserve are also listed as threatened. What we do: Our members and volunteers attend working bees on the second Saturday of each month. Our major objective is to “engage in environmental maintenance and restoration”. We remove weeds such as European Gorse, Boneseed and Spanish Heath and we collect seeds from native species growing within the Reserve’s provenance for revegetation projects. We monitor the spread of weeds from Hydro and other easements and from gardens bordering the reserve. 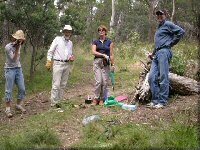 We work co-operatively with the Parks and Reserves Department at the Launceston City Council, and with the Tasmanian Parks and Wildlife Service (PWS). We arrange monthly working bees in the Reserve. The working bees are held on the 2nd Saturday of each month (excluding Christmas and January) and run from 10am to 12noon.